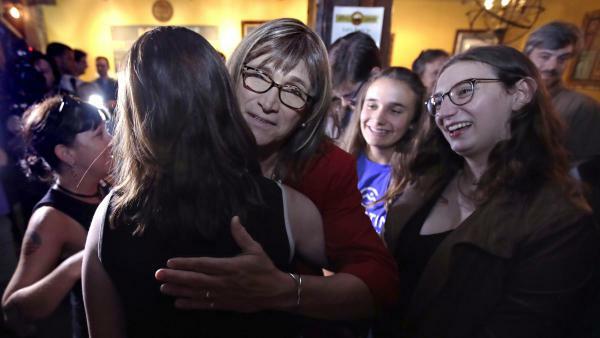 Vermont Democratic gubernatorial nominee Christine Hallquist embraces a supporter. Hallquist became the first openly transgender person to win a major party nomination for governor. State Rep. Ilhan Omar is likely to become the first Somali American to go to Congress this fall after winning her primary in a heavily Democratic Minnesota district. 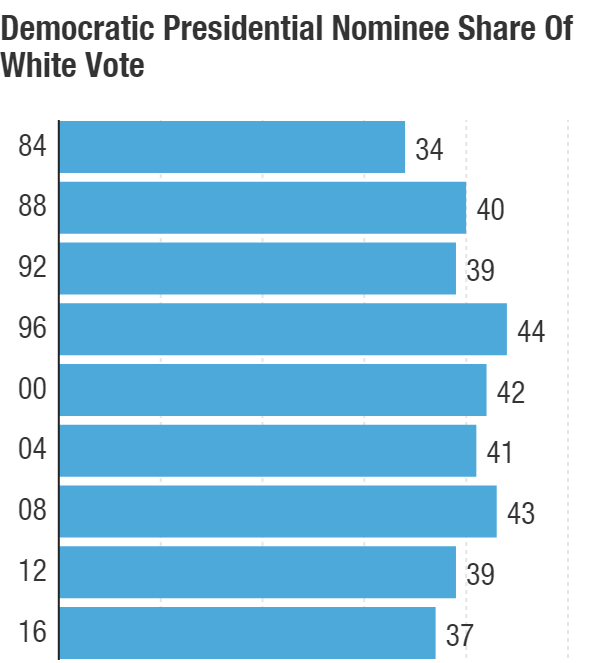 In 2016, Hillary Clinton won the lowest share of the white vote of any Democratic nominee in more than three decades. Republican incumbent Gov. Phil Scott has seen his poll numbers nosedive after signing gun-control legislation into law in April. Vermont may have a reputation as a fairly liberal state, but it also has a sizable pro-gun population as well. Scott was met with protests the day he signed the legislation, with activists calling him a "traitor." For a Republican to win statewide in Vermont, he needs his base firmly behind him, and then to win over independents and peel off some Democrats. But Scott had a lackluster primary performance. A third of Republicans voted for his little-known opponent, Keith Stern, a political novice and produce-store owner who ran on fiscal conservatism and a gun-rights agenda. Hallquist wasn't the only example of diversity among the winners Tuesday night. 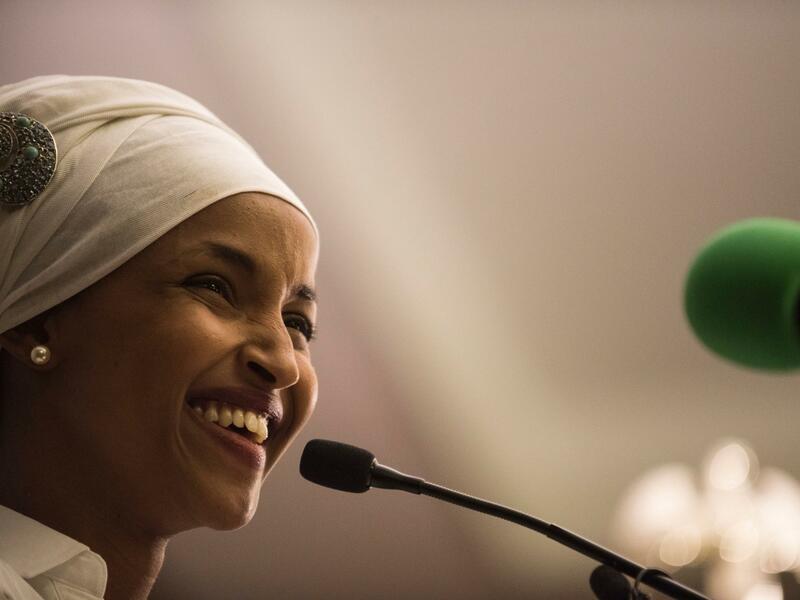 Omar, a former Somali refugee, made history in 2016 by becoming the first Somali-American to win elective office in the United States, taking a state House seat in Minnesota. Omar's win follows on Rashida Tlaib's victory in Michigan last week. Tlaib is running unopposed and will be the first Palestinian-American member of Congress. Chris Johnson of the Washington Blade pointed out Tuesday night that Hallquist's win marked a milestone for Democrats. This year, they have nominated candidates for governor who are lesbian, gay, bisexual and transgender, filling out the letters in the acronym LGBT. It also highlights how, demographically, the two parties are worlds apart. Nearly 9 in 10 people in the Republican Party are white, while about 6 in 10 Democrats are, according to a large compilation of interviews conducted by Gallup in 2013. And Trump has doubled down on that difference, catering to white grievance to win in 2016 and to keep his base behind him as president. Democrats seem more in line with businesses and universities, which are increasingly sensitive to embracing diversity, while conservatives react reflexively against "identity politics." That reaction is part of what drove Trump's winning coalition in 2016. The demographics of the country's voters are certain to become more diverse over the next several decades. Consider that even if a wall is built around the entire country, and no immigrants are ever allowed in again, the majority of kindergartners in the country are now non-white. Still, 71 percent of voters in 2016 were white, according to exit polls, which means in the short run, at least, Trump has made the gamble that there may be enough voters to propel him to a second term. Lack of support among whites was one big reason Hillary Clinton lost in 2016. She won just 37 percent of the white vote, the lowest share of any Democratic presidential candidate since Walter Mondale, who lost in a historic landslide to Ronald Reagan in 1984. What this diversity will mean in this year's election — and in 2020 — is unclear, but political polarization and cycles of bitter backlashes are typical when a country is in social, cultural and political upheaval. 2. A new phase in the #MeToo era? Speaking of social and cultural inflection points, nine members of Congress have resigned or not sought re-election this year because of sexual harassment and abuse allegations. But Tuesday night, Democratic Rep. Keith Ellison won a resounding victory for the Democratic nomination for attorney general in Minnesota — despite facing accusations of domestic violence. Ellison is also deputy chairman of the Democratic National Committee, and the party told NPR Tuesday that it is "reviewing" the allegations against Ellison. It called any allegations of domestic abuse "disturbing and should be taken seriously." Ellison vehemently denies the allegations. But Ellison's case highlights a shift in how the party and public have responded to different cases in the #MeToo era — and perhaps reflects a new chapter in the handling of these kinds of allegations. But some Democrats are questioning what the standard is for the party, if it is going to believe accusations (without further evidence) or if some change is happening. "The Franken incident has got a lot of Democrats thinking, 'We've lost a progressive hero and, right or wrong, we've lost him too fast,'" said one longtime Democratic strategist. "So, there's a little bit of a calibration on how we address these issues." And, the strategist noted, with Franken there were pictures and multiple accusations. Former DNC communications director Luis Miranda sees only one way for the party to deal with the question. "The party has no choice but to suspend [Ellison] at a minimum until they figure out what's going on," he told NPR, adding, "We set too high a standard not to take this seriously." There is clearly a tension emerging. It's going to be very tricky going forward not just in politics, but more broadly. Education is becoming a driving theme this year. As Republicans in state houses have gone after education funding, sparking teacher strikes across the country. As West Virginia Public Broadcasting's Dave Mistich noted last month, "Some of those educators are now running for public office and are on the ballot in North Carolina, Kentucky, Oklahoma, Arizona, Colorado and in West Virginia where those strikes began." And it's likely to be an issue in Kansas, too, where sitting Gov. Jeff Colyer conceded Tuesday night to Trump-backed state Secretary of State Kris Kobach. Kobach has been controversial for backing strict voter ID laws and hardline immigration measures — many of which have collapsed under judicial scrutiny. And he was the driving force behind the president's "election integrity" commission, which disbanded after it failed to find any proof of widespread voter fraud in the 2016 elections. His win means Democrats think this is another seat they can put in play. And an issue sure to be part of their push in the general election is education funding after cuts from former Republican Gov. Sam Brownback led to big teacher protests. The Democrat in the race is state Sen. Laura Kelly, who helped lead opposition to Brownback's tax plan. Week after week, from special elections to primaries, Democrats have seen high turnout. It was no different Tuesday night, which is notable because Republicans hope to compete in many of the races in these four states in the fall, and to put Democrats on the defensive. But whether they were the governors' races in all four states, a Senate race in Minnesota or key House races in Minnesota and Connecticut, Democratic turnout outpaced Republicans' — and in some cases swamped them. Note: Turnout comparisons were not possible in two other potentially competitive House races, Minnesota's 2nd and 3rd congressional districts, because candidates there ran unopposed.